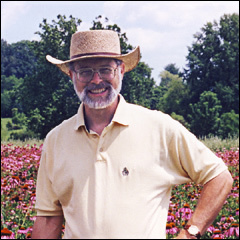 Jeff McCormack, Ph.D., is trained in natural products chemistry and pollination ecology. Formerly a faculty member at Middlebury College and the University of Virginia, he has an eclectic background that includes teaching, research, information technology, writing, publishing, and business. During the last 35 years he has worked in the fields of sustainable energy and agriculture, genetic preservation, plant breeding, and ethnobotany. As the founder, director, and former owner of the seed company Southern Exposure Seed Exchange, his efforts focused largely on locating and distributing heirloom vegetable varieties, documenting their origins and uses, and recording the histories and stories associated with heirloom and heritage seeds. Southern Exposure Seed Exchange achieved national recognition for introducing and distributing heirloom seed varieties, and through oral histories documented how they were developed and preserved. Jeff's oral history projects, documenting the stories associated with heirloom seeds, were featured on National Public Radio three times, including NPR's "Living on Earth" program. Jeff also served for eight years (1986-1993) on the board of directors of the Seed Savers Exchange, an international organization focused on preservation of our genetic and agricultural heritage. Jeff also founded Garden Medicinals and Culinaries which offers seeds and plants, with a focus on genetic preservation. His main interest involved researching the seed germination requirements and culture of endangered and threatened medicinal herbs. Jeff has authored articles on topics related to ecological pest management and genetic conservation, and has edited books on seed saving and the culinary use of herbs. He has also conducted workshops on organic seed production, has written seven organic seed production manuals for the USDA, and has founded Saving our Seeds, an informational website for sustainable agriculture and genetic preservation of heirloom seeds. He is also co-founder (with Kathleen Maier) of Virginia Plant Savers. In 2016 he began a new project conducting additional ethnobotanical research in Andros, Bahamas.